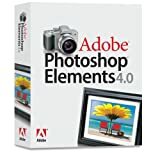 Adobe Photoshop Elements 4.0 program combines energy as well as morality to assistance we do it all: Edit as well as raise your photos, simply find as well as perspective them, as well as uncover off your creativity in large ways. Fix usual flaws now or make use of modernized options for some-more control. Keep each print during your fingertips with stretchable tagging, searching, as well as observation options. And wow your family as well as friends with interesting slip shows, print mail, online print albums, as well as most more. I read many reviews for software. I always read the worst reviews first and take what people say with a grain of salt. In reading reviews for Photoshop Elements, I see many people giving this program lackluster reviews. Not based on the software’s capability, but based on its lack of additional features over previous installments or the program’s speed. I hope to address what others have said and help you make a decision on whether to buy this program based on its attributes and your needs. Let me make it clear by saying that Elements is an excellent, if not the best photo editor in its price range. Although the price and features in this program may be more than the average person with a digital camera may need, I feel this program is an excellent choice for all types of users. Be advised, this program has a steeper learning curve than many other photo editors. In addition to that, expect to spend $30-$40 for a book to learn how to use many editing features in Elements if you are not already familiar with it. Adobe has included it’s excellent Photo Organizer in Elements 3 & 4. What’s important to realize is that the organizer is a nice way to keep track of and view all your photos, but it’s not what you would want to use for quickly viewing an occasional photo here and there. (When I double click an image file I want it open within a second or two.) It takes approximately 10-15 seconds for the elements organizer to load on my laptop if it’s not resident in the computers memory. (Longer or shorter based on computer’s hardware of course, but probably not too much shorter.) This is why many people complain about the speed of the program and the reason I don’t recommend associating elements with many of your image file types. Use a viewer to view and elements to organize and edit! I don’t have an issue with loading time because I only use it to organize and edit. When I open elements I am usually in there for awhile. I have noticed some version 2 reviewers disappointed about versions 3 and 4 taking longer to load. Another major reason of some poor reviews from Elements 2 users, is the facelift given to version 3 to look more like it’s big brother Photoshop. Change is usually not welcome when people are already familiar with the program’s interface. As far as whether to UPGRADE from elements 3, I recommend saving your money unless there is a certain feature in version 4 you must have. I really can’t believe Adobe added so little over version 3. The magic extractor and selection brush do work very well and are convenient on tougher selections but they are not the universal answer. The additional features in 4 are nice but not worth the $60-$80 price of the program. I own Photoshop Elements 3 and 4. The worst part is, I bought version 3 about two months before version 4 came out. Am I upset about that? Yes. However, I still went ahead and purchased the new Elements/Premier bundle when it released from Amazon since I did not have Premier Elements. I read some reviews stating that version 4 was slower than version 3. I have both installed on this laptop and would say that 4 is a little faster. I can also say I have no problems with the program crashing or conflicting with anything else on my computers. Some cons of Elements 4 are the removal of the file browser and many 3rd party tools and add-ons that worked in version 3, do not necessarily work in 4. If you do not own this program and are looking for an excellent organizer/editor and are up to the challenge of learning many of the editing features this program offers then take the plunge. The creativity options are endless. You will be amazed at what this program can do if you know how to use it. First thing first: whether you are considering upgrading from an older version of Adoebe Photoshop Elements (APE), or you’ve never used APE before but have gotten curious, before you buy, download a 30-day tryout copy from Adobe first. Just go to Adobe’s website, roll over Support at the top, select Downloads from the drop-down menu, find Photoshop Elements for Windows, and click the “Photoshop Elements 4.0” link in the Tryouts section. Yes, the trial version is version 4. And yes, it’s full-featuered and even lets you save files, but it will stop working after 30 days and cannot be re-installed. For me, though, none of the new featuers of v4 justifies paying for the upgrade from v3. This upgrade is an evolutionary step (and some may argue even half a step backward, but I disagree). There’s very little in this version that’s compelling for someone like me already using v3. The notorious launch speed has *not* improved from v3, and the interface remains a visual disaster for the most part. My advice as a veteran APE 3 user? Again, try out APE 4. It’s a free download and, as far as I know, spyware-free — just beware of the file size: 364MB! (Hint: you need broadband to download this.) Play with the program at your leisure and decide if it’s for you. 1) The slide show producer only allows one photo per page (in Album 2, you could put 1, 2, 3, or a repeating pattern of those numbers of pictures on a page). 2) The program is still bullheaded about where it wants to put files. Even though I upgraded with Elements/Album 2 still in place and it correctly found and converted my Catalog in the directory where I had it, it put the new Catalog in its own default directory. I had to do a Save As to get my Catalog back where I wanted it. It also didn’t change it’s default file paths for other operations to those that I had specified in the earlier version. I had to go through my Preferences and change them back. 3) When I finally uninstalled Elements/Album 2, Elements 4 reverted back to the original copy of the Catalog under it’s default directory. Once I figured that out, I just had to open my real Catalog (and delete the Catalog stuff under the default directory just to be sure). Just slightly negative or even neutral, I’d have to say speed: In my case, once I’d done a File | Reconnect, an Edit | Update Thumbnail (on all my photos), and a File | Catalog | Recover, my startup speed was about what it was with Album 2 (I always start up in the Organizer) — 13 seconds for Album 2, 17 seconds for Elements 4. Filtering on a specific tag of mine went from 1 second to 2 seconds. Really not noticable. 1) The overriding plus is the ability to do a File | Write Tag Info To Files and copy my tags into the IPTC areas of the photographs themselves. In Album 2, I had been dreading a loss of tag information or what would happen if I changed programs. Now, as a hedge, I’ve got the tag information Elements uses copied into the files themselves. So, I feel a lot better. 2) Stacks and Versions are great. I don’t do much editing of my photographs, but the ability to group them together (automatically) into version sets with only the final version immediately visible is wonderful. I also had several large swaths of photographs which didn’t need to all be displayed at once, so grouping them into stacks with a photo of my choice on top of each as the Thumbnail made things a lot neater. 3) Also, though trivial, it’s much nicer having to install and maintain the one program (Elements 4) as opposed to doing it for two programs (Elements/Album 2). Again, I’m only a light user of the program. So, I’m no expert. But, just the ability to copy my tag information into the files is enough for me to recommend the program. Everything else is just gravy. So, overall, I rate this at 4 stars out of 5. I have used them all. Elements 1 and 2. Photoshop 4.0 through CS. I have Picasa, Paint Shop Pro 8, and even GIMP. I always like Elements 2 for it’s ease of use. Photoshop CS is great, but overkill. When Elements 4 came out, I thought I would give it a try instead of upgrading to CS2. The moment the interface came up I was sadly disappointed. It may be more powerful, but it is very confusing to use. The Browser is gone…kind of… and the program is broken up into separate programs within programs. You definitely have lots of “what’s it doing now” experiences. The interface looks like…a toy. It is kind of cutesy and not intuitive at all. The thing is so cluttered now you even have less working space for your image. It confuses me what Adobe was going for. Some new team must have put this thing out because it no longer feels like Adobe. I really dislike this software. Save your money. Find a copy of Elements 2 or 3. Great software! I was going to get Premier Elements 2, but now I am not so sure….maybe I will stick with Vegas. Sorry Adobe. * They’ve got some really cool tools for selecting people or objects or areas on a photo. Basically, you just sort of scribble a bit on the object you want to select, and it automatically selects it. You sometimes have to add to the selection, but it’s really very good. To round out the selection process, there’s a magic selection brush. I’d have liked to see a feathering adjustment with this feature, but I haven’t found it yet. * The database has a new tagging function. It will go through a whole selection of photos and provide a thumbnail of any faces in those photos. It makes it real easy for tagging photos with a particular person’s name. Works really well. I tested it on a slug of Christmas photos from last year and it does a great job of thumbnailing the faces. Then just drag and tag. * They’ve now got an automatic skin tone correction. If someone looks pale or has a funny color cast to them because of lighting conditions or whatever, this will correct it automatically. Then there are sliders if you want to make them look tanner or less tan. There’s also a `blush’ slider. * It will now automatically correct red eye as it imports photos if you choose to. * There’s also an artifact reduction filter. So if you’re shooting at a high ISO, it will help pull out some of the artifacts and graininess associated with a faster `film’. Also gets rid of jpeg artifacts. Tried a shot at ISO 1600 and cleaned it up with the filter. Worked reasonably well. * There are some nice coloring filters. I’m not sure if they existed in version 3 or not, but it works well to add a color filter to a photo while maintaining its luminosity. * The user interface is natural and doesn’t depart from other versions, so the learning curve is low. * Once registered they offer 2 on-line training videos, which are well done. They are by no means a comprehensive training, but they give you some ideas on tools you can use and best practices. * I never saw the advantage to, or used the photo browser in the old version, so complaints about it being gone don’t worry me. I browse photos in Windows Explorer which as great previewing. Then I just right-click and “open with” Photoshop Elements, or just drag the photo on top of Elements. I also use the cataloging function in Elements to organize, tag and find photos. I have over 20,000 photos on my drive now and it makes it a snap to find and organize. I do wish they’d make it so that it tracks photos if you move them from one directory to another. Overall, I think it’s well worth the $50 (after rebate) to buy this upgrade. Glad I didn’t listen to the 1 star nay sayers.